When we get hurt, it can sometimes be easy to brush it off. “It'll be alright to wait until tomorrow,” or “I can handle it myself.” Unfortunately, many times we're wrong. Immediate professional attention is required. When it comes to your eyes, it is especially important to know when it is fine to wait until tomorrow and when it is an emergency situation warranting a visit to your eye doctor immediately. The difference can be the difference between continued vision and permanent blindness. Below, we will discuss a few of the major eye injuries that require that you contact your eyecare professional immediately. the event of such a cut or scratch, gently apply cold compresses to reduce swelling and bleeding, but DO NOT apply pressure to control the bleeding. This could do further damage to the eye itself. Contact your eye doctor in North Wales, PA immediately. Finally, we all work with cleaning products, fertilizers, paints, aerosols and other dangerous chemicals on a regular basis. If these chemicals get in your eyes, severe and sometimes permanent chemical burns can result. In the event of chemicals getting in your eyes, you should turn your head so that the injured eye is down and to he side, and hold your eyelid open and flush with cool tap water for 15 minutes. 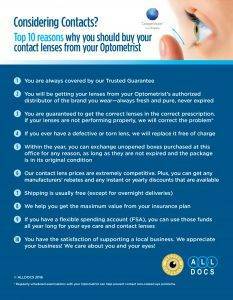 If you're wearing contact lenses, you should try to take them out. Of course, immediate medical attention should be sought. If possible, continue to flush your eyes with cool water while waiting for emergency care to arrive. For more information, contact Dr. Brewer today.